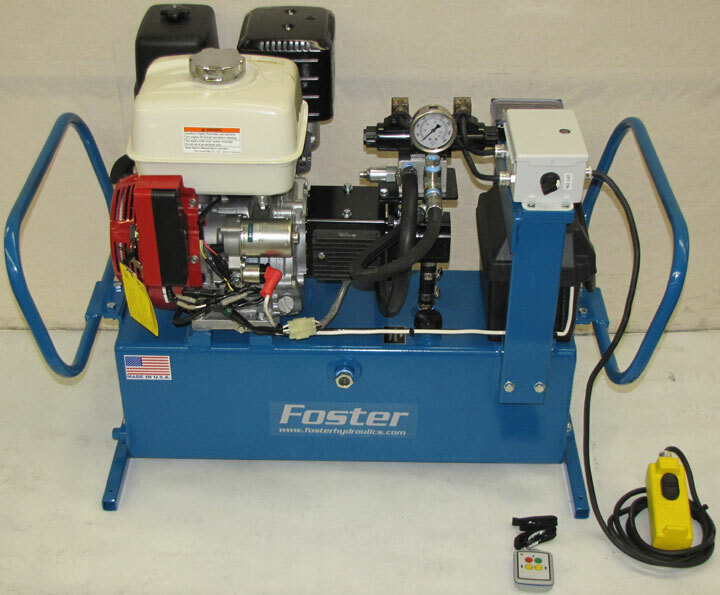 OPTIONAL WIRELESS CONTROL SYSTEMS AVAILABLE FOR SOME OF THE FOSTER GAS OR DIESEL POWERED HYDRAULIC POWER UNITS. FACTORY INSTALLED AT TIME OF POWER UNIT ORDER DUE TO SOME CUSTOM BRACKETS REQUIRED. NOTE: The optional control system can be installed on engines that have electric start and electrical charging coils rated at least 12-volt, 14 amp or higher. Charging systems of this size are typically available as an engine option on the Honda GX-390 or larger engine. Another engine choice starts with the Kubota OC-95 diesel that has an optional 14-amp charge coil available. Electric start option on some size gas engines are at an extra cost. Larger charging coils on some engines are at an extra cost. Model FWC-2F-08 kit consists of the following components. 1) Custom mounting bracket assembly that is appropriate for the power unit’s reservoir size. 2) A DO3 size sub-plate and solenoid operated 4-way, 3-position 12-volt D.C. directional control valve. Valve configuration available in either a cylinder or motor type spool (To be specified at time of order). Larger valves are available as an option. Consult with the Factory for sizing and cost. 3) N.E.M.A. Class 3-R electrical junction box with all wiring connections completed. Includes a rotary “On/Off” power switch. 4) 2-Function receiver assembly mounted and wired. 5) Hard wired “Pendant” control assembly wired to a 10-foot cord set. Pendant includes (2) momentary push buttons for control activation. Provides a redundant control system that can be used at the power unit. Note: only (1) control system to be used at a time, either wireless or hardwired pendant. 6) 2-Function wireless transmitter with a range up to 100 feet. NOTE: This optional kit is intended that it is ordered at the time of ordering the appropriate hydraulic power unit, so it can be installed and tested on the system.